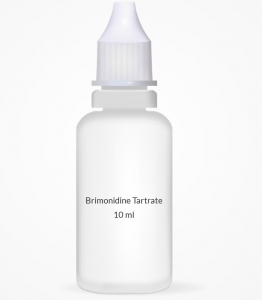 USES: This medication is used to treat open-angle glaucoma or high fluid pressure in the eye. Lowering high fluid pressure in the eye reduces the risk of vision loss, nerve damage, or blindness. This medication lowers pressure by allowing better fluid drainage from within the eye and also by reducing the amount of fluid formed in the eye. It is known as an alpha agonist. This drug is not recommended for use in children less than 2 years of age due to an increased risk of serious side effects such as very slowed breathing. Ask the doctor or pharmacist for details. HOW TO USE: To apply eye drops, wash your hands first. To avoid contamination, do not touch the dropper tip or let it touch your eye or any other surface. If you are wearing contact lenses, remove them before using this medication. After applying this medication, wait at least 15 minutes before putting in your contact lens. Tilt your head back, look upward and pull down the lower eyelid to make a pouch. Hold the dropper directly over your eye and insert one drop, usually three times daily, or as directed by your doctor. Look downward and gently close your eyes for 1 to 2 minutes. Place one finger at the corner of your eye (near the nose) and apply gentle pressure. Try not to blink and do not rub your eye. This will prevent the medication from draining out. Repeat these steps for your other eye if so directed by your doctor. Do not rinse the dropper. Replace the dropper cap after each use. If you are using another kind of eye medication (e.g., drops or ointments), wait at least 5 minutes before applying the other medications. Use eye drops before eye ointments to allow the eye drops to enter the eye. It is important to continue this medication even if you do not have any symptoms. Use this medication regularly in order to get the most benefit from it. Remember to use it at the same times each day. Do not stop using this medication without consulting your doctor. Inform your doctor if your condition worsens. SIDE EFFECTS: Eye discomfort/itching/redness, blurred vision, dizziness, dry mouth, drowsiness, or tiredness may occur. If any of these effects persist or worsen, notify your doctor or pharmacist promptly. Remember that your doctor has prescribed this medication because he or she has judged that the benefit to you is greater than the risk of side effects. Many people using this medication do not have serious side effects. Tell your doctor immediately if any of these unlikely but serious side effects occur: fast/pounding heartbeats, persistent headache, eye pain/burning/swelling, extreme sensitivity to light, vision changes. Tell your doctor immediately if any of these rare but very serious side effects occur: fainting, slow/irregular heartbeats. A very serious allergic reaction to this drug is unlikely, but seek immediate medical attention if it occurs. Symptoms of a serious allergic reaction may include: rash, itching/swelling (especially of the face/tongue/throat), severe dizziness, trouble breathing. This is not a complete list of possible side effects. If you notice other effects not listed above, contact your doctor or pharmacist. In the US - Call your doctor for medical advice about side effects. You may report side effects to FDA at 1-800-FDA-1088. In Canada - Call your doctor for medical advice about side effects. You may report side effects to Health Canada at 1-866-234-2345. PRECAUTIONS: Before using this medication, tell your doctor or pharmacist if you are allergic to it; or to apraclonidine; or if you have any other allergies. This product may contain inactive ingredients, which can cause allergic reactions or other problems. Talk to your pharmacist for more details. Before using this medication, tell your doctor or pharmacist your medical history, especially of: blood vessel diseases (thromboangiitis obliterans), blood circulation disorders (cerebral or coronary insufficiency), depression, severe heart disease, kidney disease, liver disease, Raynaud's disease, low blood pressure upon standing (orthostatic hypotension). This drug may make you dizzy or drowsy or cause blurred vision. Do not drive, use machinery, or do any activity that requires alertness or clear vision until you are sure you can perform such activities safely. Limit alcoholic beverages. Caution is advised when using this medication in children because they may be more sensitive to its side effects, especially drowsiness. See also Uses section. This medication should be used only when clearly needed during pregnancy. Discuss the risks and benefits with your doctor. It is unknown if this medication passes into breast milk. Consult your doctor before breast-feeding. DRUG INTERACTIONS: Your healthcare professionals (e.g., doctor or pharmacist) may already be aware of any possible drug interactions and may be monitoring you for it. Do not start, stop or change the dosage of any medicine before checking with them first. This drug should not be used with the following medications because very serious interactions may occur: MAO inhibitors (isocarboxazid, linezolid, methylene blue, moclobemide, phenelzine, procarbazine, rasagiline, selegiline, tranylcypromine). If you are currently using any of these medications listed above, tell your doctor or pharmacist before starting this medication. Before using this medication, tell your doctor or pharmacist of all prescription and nonprescription/herbal products you may use, especially of: beta-blockers (e.g., atenolol, metoprolol, timolol eye drops), digoxin, high blood pressure medications (e.g., clonidine, terazosin), tricyclic antidepressants (e.g., amitriptyline). Tell your doctor or pharmacist if you also take drugs that cause drowsiness such as: antihistamines that cause drowsiness (e.g., diphenhydramine), anti-anxiety drugs (e.g., diazepam), anti-seizure drugs (e.g., carbamazepine), barbiturates (e.g., phenobarbital), medicine for sleep (e.g., zolpidem), muscle relaxants (e.g., cyclobenzaprine), narcotic pain relievers (e.g., codeine), psychiatric medicines (e.g., phenothiazines such as chlorpromazine), tranquilizers. Check the labels on all your medicines (e.g., cough-and-cold products) because they may contain drowsiness-causing ingredients. Ask your pharmacist about the safe use of those products. This document does not contain all possible interactions. Therefore, before using this product, tell your doctor or pharmacist of all the products you use. Keep a list of all your medications with you, and share the list with your doctor and pharmacist. OVERDOSE: If overdose is suspected, contact your local poison control center or emergency room immediately. US residents can call the US national poison hotline at 1-800-222-1222. Canadian residents should call their local poison control center directly. This medication may be harmful if swallowed. NOTES: Do not share this medication with others. Laboratory and/or medical tests (e.g., measuring intraocular pressure) should be performed periodically to monitor your progress or check for side effects. Consult your doctor for more details. STORAGE: Store at room temperature between 59 and 77 degrees F (15-25 degrees C) away from light and moisture. Do not store in the bathroom. Keep all medicines away from children and pets. Do not flush medications down the toilet or pour them into a drain unless instructed to do so. Properly discard this product when it is expired or no longer needed. Consult your pharmacist or local waste disposal company for more details about how to safely discard your product.